One of my favorite products at Global Pet Expo was the Scratch Lounge. I was delighted when the company sent us one to review – and so were Allegra and Ruby! The Scratch Lounge is a good size, sturdy cardboard scratcher. The unique, patented three-sided design lets cats scratch to their hearts’ content, but it also gives them an alternative place to nap. It didn’t take my two little product testers long to decide that the Scratch Lounge was a welcome new addition to our home. As you can see in the video below, Allegra approves by demonstrating proper scratching technique. I like that the Scratch Lounge is large enough to accommodate the full length of Allegra, even with her front paws stretched out. I think this scratcher is going to last a long time, even with daily use. The super-dense honeycomb cardboard is glued with a wheat-based non-toxic glue. The Scratch Lounge is made in the US from 100% recyclable material. 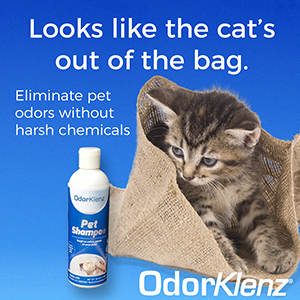 It comes with a bag of extremely potent catnip. I didn’t need to use the catnip to attract Allegra and Ruby to the scratcher, but they sure were interested in the little plastic baggie the catnip came in! The Scratch Lounge is available from Amazon, and many retail stores. For more information, please visit http://www.ScratchLounge.com. 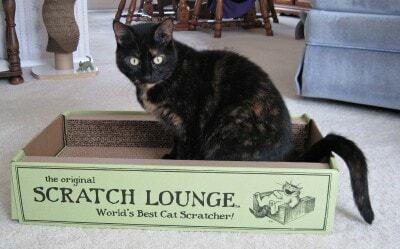 The home page features some adorable videos of kitties who love their Scratch Lounges! And, since you didn’t mention it: To prolong the life and use of the “floor mat” you can turn it upside down and reverse it, and have a brand new long lasting scratch pad that doubles it’s life! I have had these for a long time for my cats, and I remove one side panel so that it is open, with a little ramp to walk in, and my cats love to sleep there! Great durable product. This is by far, one of the cats’ favorite scratchers. Wally especially likes it. In the past 5 years, he’s gone through 3 of them. Not that it’s not made well, it is…he just loves to scratch it. If I had one complaint it’s that they don’t offer refills for the side scratcher, only the bottom. And the sides are what Wally really likes to scratch. FYI, you can remove the cardboard on the ends and then the cats can really lounge on it. Our newest escue loves the simple version of this and I suspect both of them would enjoy this one. Does look very nice. I like scratchers that are bigger and last longer. We didn’t know about the wheat-based non toxic glue. VERY cool. I picked up one of these at a local pet store and my cats love it! I have one that loves to sleep on the flat scratchers and this is her favorite. Even my fat cat loves it! We love the Scratch Lounge. You can buy the replacement scratcher inserts (the floor only) for $10 from the Scratch Lounge website. The worn out inserts can go into the recycling bin. It’s much cheaper than replacing the whole unit, and the box itself is very sturdy so it lasts for years. We did a review on the Scratch Lounge after the 2013 Expo and you are very right to surmise it will last a long time. Each of the cats take their turn in it, sometimes to scratch and sometimes just to lounge. It’s funny how they seem to have set up a weekly rotation schedule. Good to know that it lasts that long, Jobi and Fisher!